During one of my rummages through emails obtained from FOIA requests, I stumbled across the National Study on Learning, Voting, and Engagement (NSLVE) from Tufts University. This study combines enrollment data with voting records to determine the student voter turnout of participating campuses. Because of the controversy over the long line at the polls in the Holmes Student Center during the past midterm election, I thought this study was very important to the community and decided to do some digging. When I tried to find the results for NIU, however, I quickly ran into a roadblock. The executive report for the study doesn’t provide a breakdown of each individual campus. The researchers leave the decision over whether to publicly release campus reports up to each of the participating institutions. Fortunately, public institutions are subject to FOIA, and so I submitted requests to every public university in Illinois. But, unfortunately, I hit another roadblock. NIU wasn’t a participating institution. So, in the future we can begin to have conversations informed by the NSLVE about which students are voting and which are not and act accordingly, but until then there still needs to be a general effort to encourage students to register, vote, and be civically engaged. Because good governance starts with participation. One of the things I observed during this most recent municipal election was a common refrain that enrollment was down and that students are not shopping in DeKalb or choosing to live here. But I did not hear much about connecting students with the local area or addressing their wants and needs. As a younger alum who served as a student leader, it upsets me to continually see this patronizing attitude which treats students as merely transient wallets to empty. Now that NIU has already taken steps, I hope it is not too progressive of an idea for me to suggest that if businesses want students’ dollars in their establishments, then perhaps they should do some work to convince those students that they have a stake in this community. I’m going to begin this blog post by pointing out that on the City Barbs group we don’t adhere to strict standards of civility. Instead, we try to permit heated moments in which citizens may vent their frustration at public officials. If a citizen is justifiably aggrieved, expressing their anger how they see fit helps to communicate just how abhorrent the situation has become. I find myself in this quasi-media role as a political forum moderator and blogger with a dilemma about what to do when a public official begins to write abrasive posts in response to constituents. You can ordinarily expect them to act professionally. However, serving in office can be a thankless job, especially in high conflict communities where listening to every lamentation and ill-informed opinion can be grating on one’s patience, and occasionally there are instances when they lose their temper. I have wondered if perhaps those who volunteer to do it deserve a little clemency every once in a while. On Monday, February 11th, the City Council discussed an ordinance to amend the rules for public comment. Those who regularly participate know that there is public participation at the beginning for speaking about anything that is not on the agenda, and then there’s also discussion reserved before each agenda item. This has often led to members of the public waiting hours through long meetings before having any opportunity to speak to their item of interest. The ordinance presented would move all public comment to the beginning except for people who “have a unique standing relative to a given item.” The trade-off to this is that if someone wanted to speak to an item on the agenda and also some other matter not germane to anything on the agenda, it would diminish the total time they would be afforded. Now, I want to draw attention to Alderman Fagan’s remarks. That outburst had startled me a bit as I listened to the audio on my computer. I had to go back and watch it to try to see what had caused the commotion, but with it having occurred off camera I assumed he was yelling at one of the two who had commented, Bessie Chronopoulos or Steve Kapitan. Bessie later informed me that it was her mumbling something to herself which provoked him. My fellow co-moderator was speaking out of order despite not directing her comment at council. While being interrupted is frustrating, after a few awkward seconds of silence he didn’t really have anything more to add. So, it wasn’t serious enough to make this kind of reaction worthwhile. It only served to browbeat. This on top of the fact that he’s arguing in favor of rolling back opportunities for public comment to the minimum required by law sends the message of wanting to control the conversation and shut the public out. I’ve decided that I’m going to apply the same general standards and expectations of conduct as ordinary citizens. There are multiple reasons for this, but the obvious one is because it is my intention to ensure that public officials are responsive to citizens. You can raise your voice, YOU CAN TYPE IN ALL CAPS, you can give the occasional insult in a good-natured ribbing. If a citizen is responsible for some egregious harm to city council or the community, then the public officials should have a similar liberty to direct their ire at what they find objectionable. But any action that escalates conflict, makes anyone feel unwelcome to contribute to democratic discourse, or serves to censor speech is simply not appropriate, and that’s the case in this instance here. The mayor, as chair of the meeting, should do more to address such outbursts in the future. I’m one of the new mods/writers for the City Barbs Blog selected to fill in for Lynn Fazekas after she took the office of City Clerk. While some readers already know me, I thought it would be best to introduce myself. So, firstly, I’m an NIU alum who majored in computer science. Yes, sadly I didn’t major in journalism. But if it makes you feel any better, I once pursued an associate degree in philosophy before I realized that it wasn’t going to make me money any time soon. On the plus side, there is likely to be data in posts of mine if you’re into that sort of thing. I’ve written several letters to the editor and attended/watched some city council meetings in the past. Lynn would tell you she picked me because of my commitment to the truth, but I’m doing this because I’m easily bribed with food (just kidding, sorta). What else? I’m an Air Force veteran where I worked in metrology; I have interests in the 1st Amendment, OMA, FOIA, local history, and education; and I used to catch plagiarism in computer programming courses for a living when I worked as a teaching assistant, so I can pay quite a bit attention to detail. I’ve been conversing with Lynn and Bessie over the past few weeks to get an understanding of the forum rules, the origins and the role of the blog, current issues, etc. while we transition the responsibility of running this gig. Please forgive us for any delays as Bessie is still learning how to use the newfangled Facebook thing, and I’ve been somewhat apprehensive to act independently and make snap judgments. We appreciate your patience while we try to get things settled, and I can assure that all of us have the same desire to maintain a forum of political discussion where everyone feels welcome to participate. We do have some posts planned for this month but let us know if there’s anything you’d like us to focus on. I also want to say something about the State of the City Address held last week. I had planned to attend and had taken the day off from work, but I was turned away because they didn’t have a card reader at the door. While it has been pointed out that the address was recorded and posted online, the event itself was nevertheless one of breaking bread and a mingling of minds. There was more there than the statements of a couple government officials, there were conversations – ones of not just economic importance but social and cultural as well. As a citizen journalist who wishes to be informed of matters so that I might in turn better facilitate discussion, I am now less able to do so. And considering the relatively steep price of the event and the fact that this was done prior to the official State of the City Address, the impression given (hopefully inadvertently) is that the interests of the community at large are less of a priority than solely business interests. In the future, the City should make every effort to avoid barriers which prevent all members of the public from listening and contributing to such conversations, and if it wishes to continue holding these events with the Chamber of Commerce, then I would recommend hosting it in the commons to avoid even the semblance of impropriety. 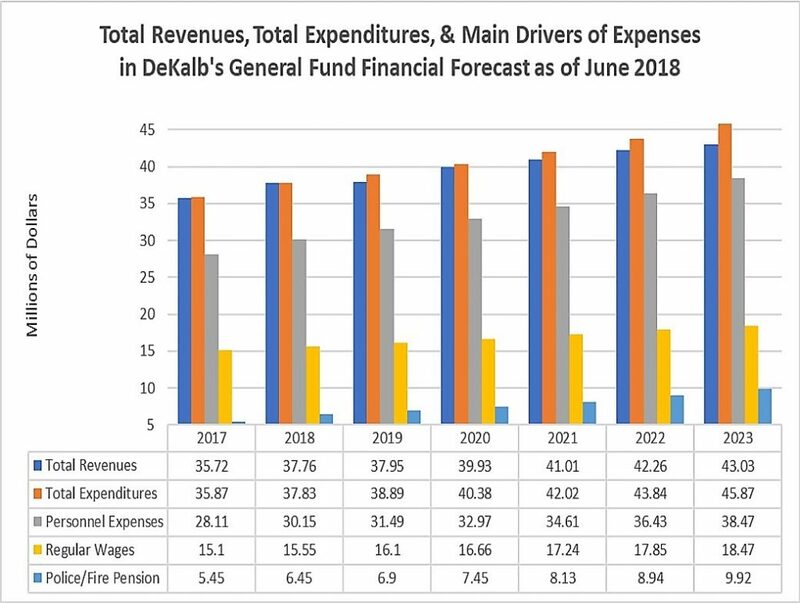 I’m still posting occasionally in the City Barbs Facebook group, and would like to share this item about DeKalb city council’s budget workshop Tuesday evening: Discussing elimination of positions as a budget-balancing measure. On Monday, unlikely as it may sound, DeKalb city council might vote to appoint me to the office of city clerk. No matter how it turns out, the fact remains that Mayor Jerry Smith has placed under consideration a person who can be a vocal critic of this administration. That takes a bit of nerve. I was trying to think of the last mayor who might have done something similar, and came up with Mayor Frank Van Buer, who appointed the redoubtable Mac McIntyre to the city’s Finance Advisory Committee 10 years ago. Let’s give due respect, because this type of inclusion doesn’t happen every day. Whatever success I’ve enjoyed as a blogger has depended in large part upon people’s not being afraid to talk to me. My assumption is that effectiveness as the city clerk involves the same level of trust. If appointed, then, City Barbs blog would go into other hands or on hiatus, and a trusted group of moderators would manage the Facebook group. But maybe there would be clerkblog. You need to know what that hole is, even if you can’t solve it right now. ~Larry Kujovich, Executive Partners, Inc., addressing the DeKalb city council on strategic planning (2013). There’s city council support for a Committee of the Whole meeting to air issues with the city attorney’s project to expand the types of ordinance violations the city will hear in-house. I think the CoW is going to happen, and I’ll keep you posted. If so, it’s an excellent development, and shows council’s responsiveness to constituents’ concerns. Perhaps we’ll soon see the end of the pattern of staff’s working on pet projects in secret, then bursting onto the scene in create-a-crisis mode. Here are five considerations for discussion. 1. The circuit court’s deadline does not have to be our deadline. If the court decides to conduct its ordinance violations process at the courthouse instead of city hall as of July 1, then people will have to travel to Sycamore for a while. If the court changes the day of the week that it conducts the hearings, people will have to change their calendars. These logistical inconveniences are not good enough reasons to risk errors. To get the ordinances right, we need to set our own pace. 2. This is the city manager’s job. It’s the city manager who oversees DeKalb’s administrative hearing procedure, via appointments to the city’s ordinance enforcement division. The new manager should have an opportunity to provide his or her perspective, including an opinion on the scope of the program. We also have no idea so far about the financial consequences of adding permanent staff, not to mention our continually increasing dependence on punishing people to fill budget holes. County support of Frieders’ initiative? So as we were saying the other day, DeKalb city attorney Dean Frieders made a pitch for in-house adjudication of local ordinance violations via administrative hearings. To be clear, DeKalb already does administrative hearings, but it’s limited to violations related to the administrative towing ordinance, parking citations, and city-issued licenses. So what we’re talking about is an expansion in what DeKalb would handle itself, as opposed to using the circuit court process. Frieders said the chief circuit court judge and state’s attorney support the changes. I’m sure that’s true and it’s fine. These officials get to run their offices the way they see fit. But county board members contacted by citizens since the presentation, including members of the Law and Justice Committee, hadn’t heard of it. They should have, because budgeting. Continue reading County support of Frieders’ initiative? At the end of last week’s council meeting in DeKalb, city attorney Dean Frieders presented an argument for in-house adjudication of ordinance violations. Currently, DeKalb conducts administrative hearings on very minor ordinance violations at city hall once a week as an administrative branch of the circuit court. Frieders’ plan would detach DeKalb from the county-level judiciary, and DeKalb would handle more types of ordinance violations than it does now. This would be major, right? You could reasonably expect the changes to affect ordinances, staffing and budget, with impacts to individuals and businesses. Yet the item did not appear on the agenda for the meeting, because Frieders made the pitch during the part of the meeting listed as “Reports – Communications” (“Reports”). “Reports” does not individually specify what to expect, because nobody knows. It’s essentially a “Good of the Order” that involves non-actionable items such as announcements, updates and general comments on the conduct of city business. Doing it this way also provides no opportunity for public comment. So what you wouldn’t expect is use of “Reports” to introduce a major initiative as if it were a routine progress report on a course of action already publicly approved. Yet that appears to be what happened. I’ve talked to at least a half-dozen fellow city watchers and nobody remembers any public discussion of in-house adjudication. It’s also not on any city agenda posted this year that I can find. Where this item actually belonged, then, was “New Business,” with its own subject line and its own explanatory memo stuffed into the backup packet. People actually do skim city agendas to find and research items of importance, and in this case they couldn’t because it wasn’t there. DeKalb city council will discuss its condemnation procedures at committee of the whole Tuesday, May 29, beginning 5 pm. Proposed changes are here. What I like about the proposal are the addition of follow-up steps: to gather contact information on residential tenants for ongoing notification purposes, and to assist evacuees to relocate. One thing that council should not do is put the contrived “emergency condemnation” procedures on the books. What went wrong with the last condemnation is not that current procedures are inadequate, but that the city didn’t follow them. When inspectors found problems with Lord Stanley’s last fall, they should have re-inspected them, warned them, penalized them, called in the county, and notified everybody properly. They did none of these things. Instead, the city ambushed them with what looks now to have been a fake emergency. The fiasco was a standout for its utter lack of due process, and to put a seal of approval on this invention of “emergency condemnation” would only encourage future abuses. Even to consider a rewrite of these codes is bizarre. DeKalb has adopted the International Building Code for handling these matters. What’s good enough for the rest of the country will work for us if we follow it.